The overnight oats concept is not a new thing. Not even slightly a new thing. And now I’m kicking myself because it took me so long to try it. I can be stubborn that way, refusing to give in to the latest big thing. I can’t start my day without breakfast, and am always looking for meals that are rich in protein to get my work and play off on the right foot. 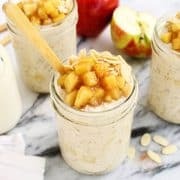 This recipe for Apple Cinnamon Overnight Oats is my first step toward many delicious make-ahead breakfast meals in my family’s future. I was skeptical that I would get everyone onboard, but these breakfast jars have been an overall hit. The oats are ultra creamy from an overnight soak in milk and yogurt, and studded with gorgeous bites of fresh sautéed apples with cinnamon. Kinda like a little apple pie worked into your breakfast! * This is a sponsored post, created in partnership with Milk Life. Every fall, after visiting our local apple orchard, I make several batches of sautéed apples for our family. We eat these sweet, golden nuggets warm or cold…in a dish all by themselves, or spooned over pancakes, waffles, and ice cream. They are a treat, and I knew these apples would help entice my family to give overnight oats an honest try. I’m excited to partner with Milk Life to help spread the word about how important milk is. With essential nutrients, including high-quality protein, I know that milk helps our kids do their best learning and playing, and just plain growing. 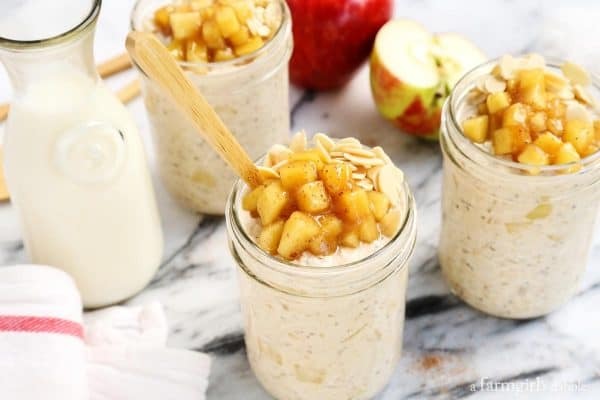 Milk is an ingredient in these jars of Apple Cinnamon Overnight Oats, giving this breakfast a boost from the very start. And if you know my family at all, you know that there’s additional glasses of milk poured to drink with our breakfast. We drink milk with breakfast, lunch, and dinner. And snack time, too. I’ve actually been questioned in the check-out line at grocery stores on more than one occasion, “That’s alot of milk. Are you having company?” Well, no. That’s what our grocery cart always looks like, every single week. Milk is an important component of our family’s diet. Our family is blessed that we always have enough food on our table and milk in our glasses. But unfortunately, that is not true for so many people in this country. Over 48 million Americans (or 1 in 7), including more than 15 million children, are food insecure. I’m thankful that Feeding America, our nation’s largest domestic hunger-relief organization, has been so incredibly diligent in helping our country’s hungry. At Feeding America, 98% of all donations raised go directly into programs and services for people in need. 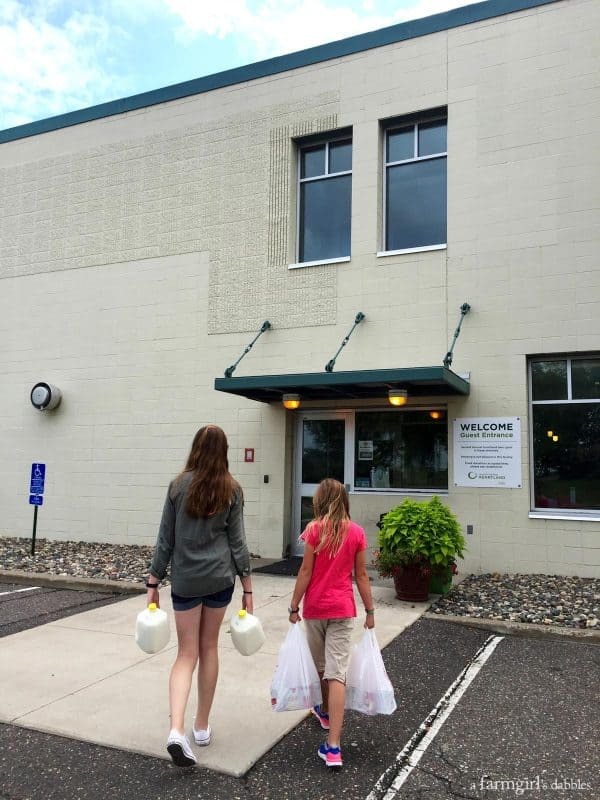 Earlier this month, our daughters and I had the opportunity to visit our local Feeding America food bank, Second Harvest Heartland in St. Paul. We stopped at our local grocery store on the way to the food bank, to pick up a couple gallons of milk and some canned fruits and vegetables to donate. And we were surprised to find out that the food bank could not accept our perishable donation. We had to take the milk back home with us. But there is a way to get fresh milk into the hands of those who need it, through our local food banks. Please read on; I’ll tell you how. 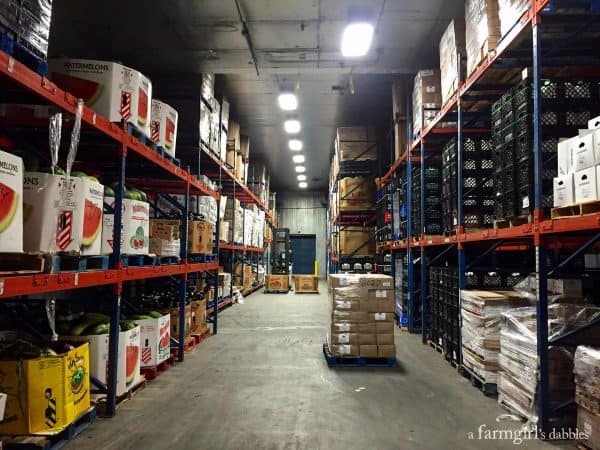 Our daughters and I were able to walk through this Feeding America distribution facility and see the many aisles of perishable and non-perishable food items. 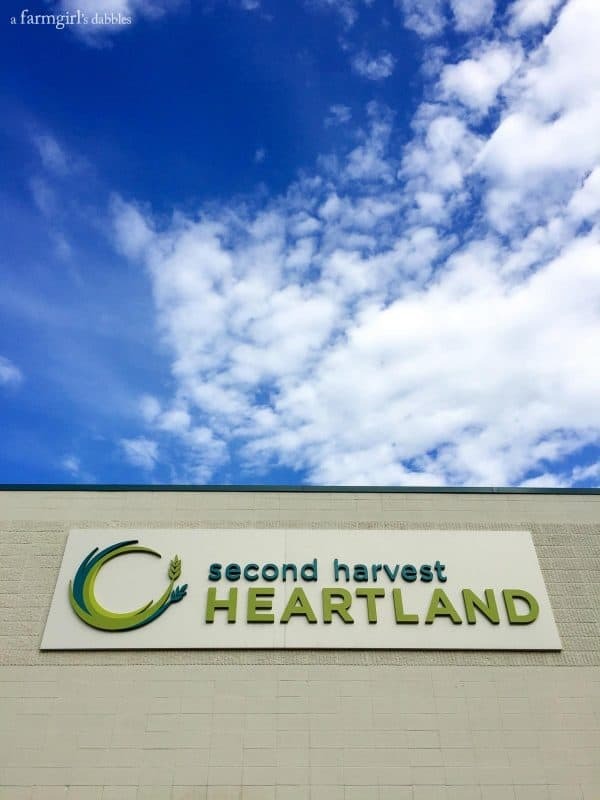 Second Harvest Heartland provided 84 million meals in 2015 to people in their service area, which includes most of Minnesota and a portion of western Wisconsin. Every year, they help put food on tables in a variety of ways, including school-based pantries and a senior grocery and nutrition program. 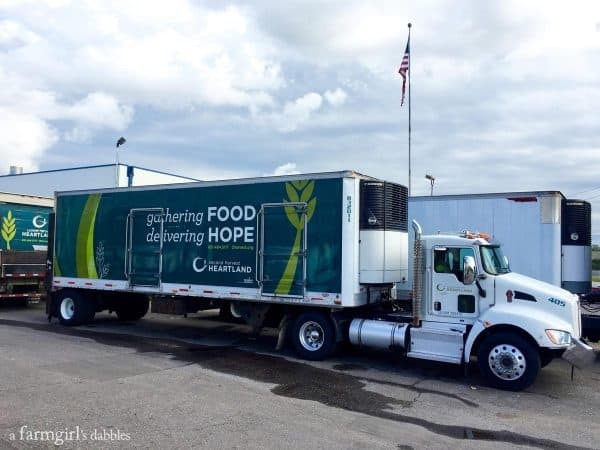 Second Harvest Heartland sends twenty-five trucks out on the road, five days a week. These trucks collect food from local grocery retailers and a variety of other sources, rescuing food that is still good, that would normally get thrown away for being in less than perfect condition. It was beautiful to hear the passion in the voices of those who work so hard to ensure that good, nutritious food reaches the people who need it most in our local community. 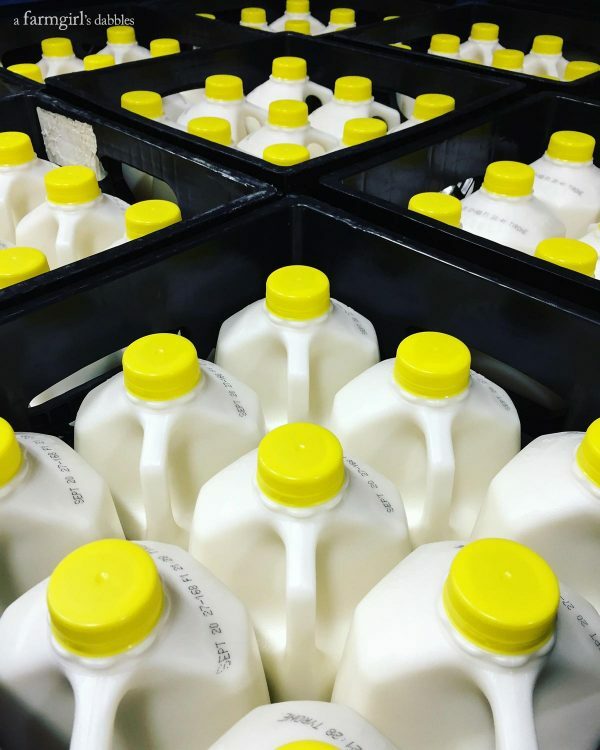 Did you know that fresh milk is one of the items people request the most? And did you know that milk is one of the least donated items? Every 8-ounce serving of milk provides 9 essential nutrients, including 8 grams of high-quality protein. Nutritionists recommend that each person drink three servings of milk per day. 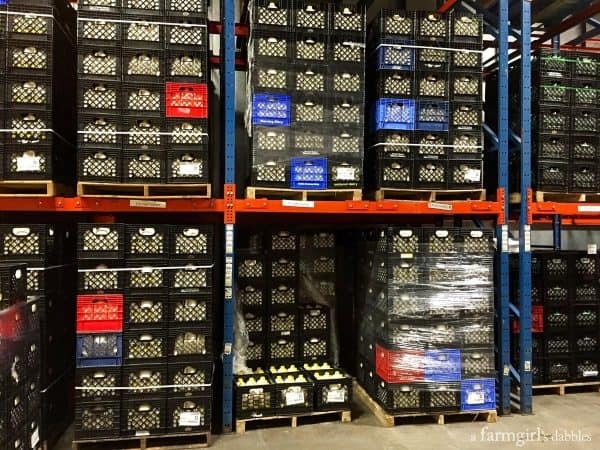 But on average, Feeding America food banks only have enough supply to provide one gallon of milk…per person…per year. September is Hunger Action Month at Feeding America, and the perfect time to think about giving back to your own local community. I’m partnering with Milk Life for The Great American Milk Drive, a collaborative effort between Feeding America and America’s dairy farmers and milk companies. This drive helps to deliver fresh milk to children and families in need. For as little as $5, you can help people in your own community. When you make a donation either online or at a participating grocery store, those dollars get invested right back into your local area. Milk vouchers are distributed to people in need, which can then be redeemed at the grocery store for fresh milk. To Help: Give now at Milk Life. Use the hashtag #MilkDrive to follow along on social media. You can find Milk Life on Twitter, Facebook, Pinterest, and Instagram. Now here’s that recipe I was telling you about. I hope you enjoy many mornings with this Apple Cinnamon Overnight Oats. 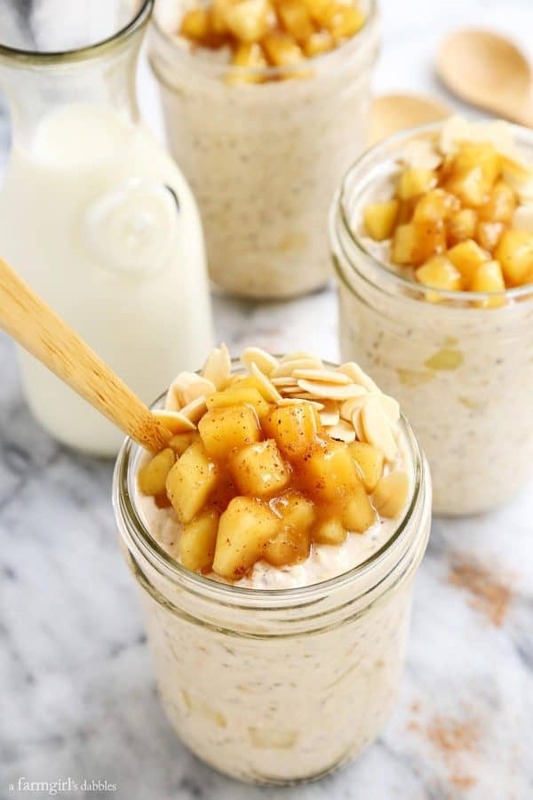 This recipe makes a large batch of the apple cinnamon mixture and then gives quantities and directions for making single servings of the overnight oats. This allows you to make up as many individual servings as you like. The apple cinnamon mixture should allow for 6 to 8 servings, depending on how much you use for each serving. The apple cinnamon mixture keeps well in the refrigerator for up to six days. The combined oats mixture keeps well in the refrigerator for up to three days. In a medium saucepan over medium to medium-high heat, stir together all ingredients for the apple mixture. Stir regularly until mixture starts to boil. 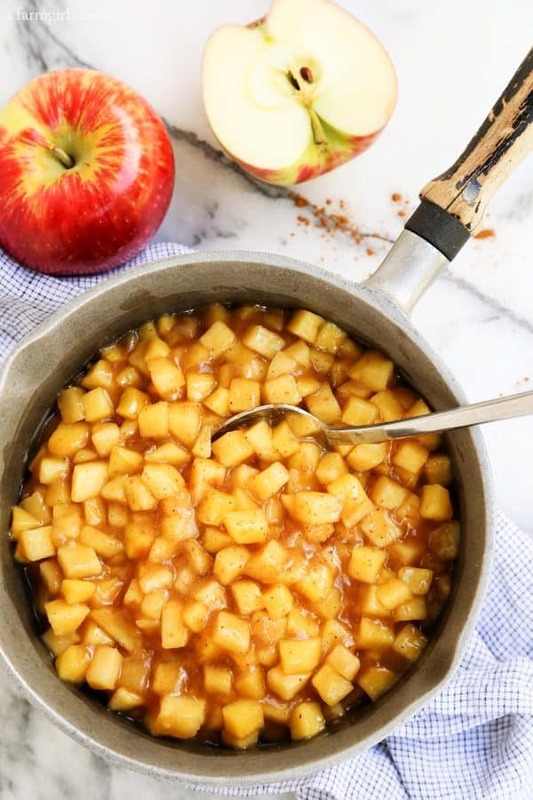 Once boiling, turn heat down to low and cook for another 5 to 10 minutes, stirring frequently, until mixture is thickened and apples are tender. I like the apples softened, but with a little bite left. Remove saucepan from heat. In a single serving bowl or jar, stir together all ingredients for the oats. Cover and refrigerate overnight. The following morning, give the oats mixture a little stir and then top with sliced almonds and additional apple cinnamon mixture, if desired. Combined oats mixture keeps well in refrigerator for up to three days. I am honored to partner with Milk Life to spread the word about The Great American Milk Drive. This post is sponsored by Milk Life. All opinions are my own.